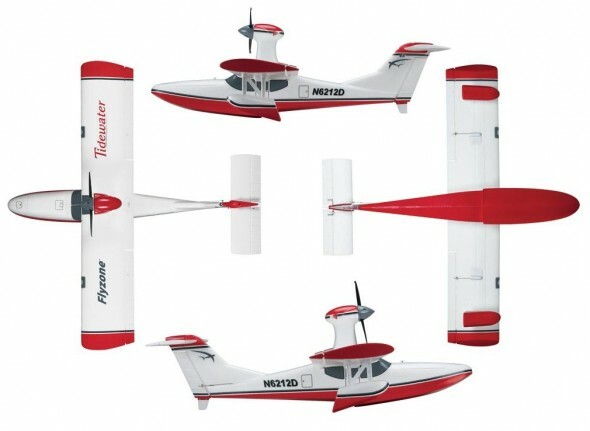 The Tidewater assembles quickly without using glue and features a trim scheme reminiscent of many modern seaplanes. With predictable flight characteristics and easy water handling, takeoffs are a snap, whether from water, grass or by hand. At full throttle, the Tidewater is fast and powerful. The motor and propeller are contained in a pylon positioned atop the wing, which helps keep them dry and ensures pilot safety during hand launches. The fuselage bottom is carefully contoured to reduce water spray and deliver excellent handling while taxiing and during takeoffs and landings.